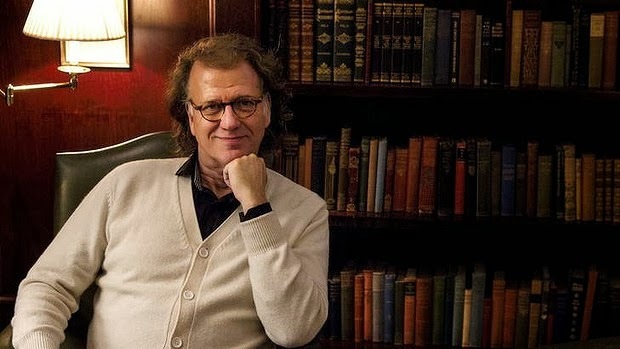 Interview by Jakob Buhre: For his audiences André Rieu always serves them a light fare, but in private however, he pays attention to a balanced diet. A conversation about boring symphonies, abridged classics, plans for a pizzeria and the question of what exactly he plays on his really expensive violin. It may seem surprising, but with André Rieu’s huge success is not about the qualities of the violin. Although he is seen in almost every photo with the instrument, but during the concert the 64-year-old Dutchman plays mostly in line with his orchestra and very rarely a solo. Rather, they are his entertainer qualities which annually attract hundreds of thousands of listeners to his concerts and the ability to create a symphonic kind of party out of classical music, pop, pop songs and waltzes. 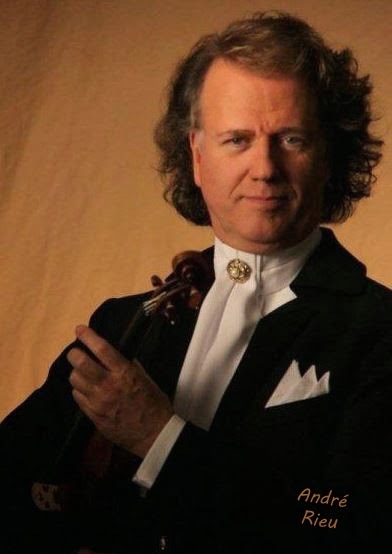 Mr. Rieu, how do you choose from the works which you perform? Rieu: Quite simple: I of course do that with my entire heart. If a piece touches me, then I know that it will also touch my audience – no matter the manner or fashion whatsoever. If I want them to cry because I already cried when I heard that song for the first time, then I arrange it so that it will then also come across to the public that way. Is there an example from the recent past? Rieu: Yes, I had invited the Jostiband to be on stage with us in August 2013. This is an orchestra for mentally handicapped people. And they played the "Hallelujah" by Leonard Cohen. That immediately touched me, so I made an arrangement right away for them and my soloists. That was really nice. And the audience was, just like me, very pleased with that. When Nelson Mandela died, we were on tour in England, and Kimmy Skota, our South African singer, sang for this occasion, a well-known South African song, while we displayed pictures of Mandela. I want to remain programmatically flexible in order to respond to current events. Could you tell how a piece must musically be designed, so that it fits in your show? Rieu: That's my intuition. We were once on tour with colleagues from a television production, and after the concert we were in a bar. My pianist had a thick book with all sorts of pieces there which we just played and I said: "If it fits; No - no - no - yes!" And the guy from the production company told me the next day: "Now I understand; you just do it with your intuition." Does the music have to be "beautiful"? Rieu: That depends. Beautiful is just relative. One finds Mozart beautiful, the other one does not. Still others feel Wagner's "Ring" just as entertaining and beautiful as an operetta by Offenbach. We play music which I find touching and that appeals to me. And that's mostly nice, yes? And harmoniously? Rieu: For my programs, yes. I think that's my secret. Although: What does secret mean? - It simply functions like that. There are pieces in your program, in which people are able to move. Rieu: Yes, but not all of them. However, I hope that they move when a waltz is played. That is why he is there. With you one can frequently clap along? Rieu: That is not the case with all pieces. You know, currently there are more and more people studying me and asking: "What is the secret of André?" They analyze me from right to left and from top to bottom. (Laughs) They come up with all sorts of explanations that I transform classical music into a single sausage. – That my audience goes home incredibly happy, no one speaks of that. What of personal interest is to me is which kinds of works you play. Rieu: Everything. For a large open-air concert the program is of course different than for a hall where I have the total quiet. But I must say that the people out there are also totally silent when we play a "Do not cry for me Argentina" or "Time to say Goodbye". Playing an entire symphony would bore me. We are speaking about an audience which might not trust in the great concert halls, who find Mahler, Bruckner and Bartok too "heavy". If Chopin had lived today, he would have done exactly the same. Conflicts and drama, I find all well and good, but not with me on stage. Could you say, which composers, regardless of gender, who you are particularly fond of? Rieu: I think Andrew Lloyd Webber is a brilliant composer, he has written many wonderful pieces. Do you actually still attend classical concerts? Rieu: I would like that, but do not know when I actually could do that. We are mostly the entire year on tour. When was the last time you attended a concert? Rieu: Oh, that was long ago. I think that was in Vienna when the Concert Building Orchestra played a Mahler symphony. I really liked that, a top orchestra, a top Hall. My wife remembers and particularly enjoyed the Viennese State Opera visit. She loves opera. In your autobiography you write about concert experiences, which are often serious for you. Rieu: Yes, that is true. Recently, one of the directors of the Concert Building was in my concert and spoke with great respect about how I put everything together here, without subsidies. He said that was for the Concert Building not easy either. That's why they now, for example, have made a Road Soap for television. One can show the people the behind the scene activities. For example, one could show a clarinetist and a violinist, who are married, saying goodbye to their children and they are sad because their parents are now going on tour. That puts emotions in it. - That has achieved a lot of good, suddenly people understand: Hey, the orchestra members, they are normal people. So, to create closeness with the audience is important? Rieu: Yes, that comes from the times of the elitist and strict attitudes. Sure there are people in the classical music field, who say: "No, I do not need that, I know how Mahler sounds, I do not need to know who the violinist is." But with an attitude like that, other people can then gain access to classical music. How important are the violin solos in your concerts? Rieu: It depends on the program, or if I like it, or if it fits in the program. Every year I make a different program. Is there still a particular composer with which you would like to perform? Rieu: When I hear something great, then yes, why not. But I do not plan on that. The 2013 ABBA was new; we had never done that before. The occasion was the 40th anniversary of "Waterloo", that is how the idea was born. If you select a piece, will it then also be arranged? Rieu: Yes. What exactly are you doing that has changed? Rieu: Oh, then you have to come and experience one of our rehearsals. I have to consider which of our instruments would best be used for which of the original melodies. For example, in "The Winner Takes All" I immediately had a violin solo in my head, for the main melody. In "Chiquitita" the trumpets take over the melody in the second verse. You have to try and feel how you can enhance the mood of the original. For instance, you change the sound. Rieu: Yes, when I so desire, then I do that. Johann Strauss, for example, did that often. If the space in the hall was too small, he would then leave half of his orchestra at home, and then there was again another arrangement to listen to. You have for instance arranged Chopin’s Etude Opus 10 No. 3. Would you prefer to listen to the original or your version? Rieu: I do have a weakness for strings, so the orchestrated version of mine is better than the original piano etude. What do you add to the original? Rieu: That, what I feel. Then I think very often: If Chopin had lived today, he would have done exactly the same. Does that also apply to the Shostakovich waltz, which you have supplemented with a choir? Rieu: In the past there was not a choir in my arrangement. Now I tour with a choir, and they sing along. It has no intellectual ulterior motives; I have to disappoint you with that. What would happen if you would ever performed an entire Beethoven symphony? Rieu: I would never do that. Because, I would feel too restricted. I know the entire classical music and I have lived in it, my father was a conductor. I know it all and I would never do that. Maybe you can compare that with an actor who wants to play "Hamlet". But there are also many others who instead go to LA, make famous movies and by that make them feel so much better. And you will not play "Hamlet" in a theater but rather in a big Hollywood movie? Rieu: I think so, yes. I have a good relationship with Anthony Hopkins, and he says that too. When the intellectual critics ask him: "Why do you play in such a movie, while you can perform Shakespeare in London in the theater?" – He then answers: "I do it for the money" (laughs), and then they all change their tune. No, I would not say it so blatantly "just for the money" - but a Beethoven symphony, that would make me feel too restricted. Why "restricted?" Isn’t that beautiful music? Rieu: No, not an entire symphony that would bore me. I would take the most beautiful parts from there if I would do that. I would take a part of the symphony, shorten it and then make a hit out of it. Besides, there are enough classical orchestras in the world who play that completely. Our success is that we are totally very different. Thus we appeal to an audience which might not dare to enter the great concert halls. Mahler, Bruckner, Bartok are all "too heavy". With us they feel at home. There are people who have not danced in years. With us they stand up and do that, that's fantastic. Do you then play Mozart's "Eine Kleine Nachtmusik" in its entirety? Rieu: No, only the most beautiful parts. Our evenings are not concert evenings in the "classical" sense. There are always potpourris. In classical music there is much drama and conflict. Do you prefer the joyful side of the Classics? Rieu: Yes. Conflicts and drama, that is all well and good, but not for me while on stage. I have had enough conflict and drama in my life; I like the sunny side of life. One can easily compose an evening with drama and everything else - but it's much harder to make the people laugh. I like that much better. Besides: In every German or Dutch small town there is a symphony orchestra playing all these symphonies. I know them all, every one - but for me that is too boring. With that you would probably not even fill the large Vrijthof Square in your home town of Maastricht, where thousands of people come every year to your concerts. Rieu: No, of course not. They would all fall asleep and say: "But I did not come from England for this." Have you ever fallen asleep in concert? Rieu: In the past, as a child, yes. At your father’s concerts? Rieu: Yes, I was always at all his concerts. What did you like back then? Rieu: When I was 14, Baroque was everything for me and I wanted to be a Baroque musician. Then I got older, listened again to more romance and later through my wife Marjorie I learned to totally appreciate operettas and lighter music. Her father had a huge record collection. That shaped me into what I am now. Are you more a conductor or a soloist? Rieu: Phew, in the sense I am neither a pure conductor, soloist, entertainer nor a businessman. I am ultimately a combination of them all - and that's why I am successful, I think. I studied the violin, not conducting in the classical manner or studies in business. But I can conduct, and especially above all make music. What exactly do you play in your concerts, the first violin parts? Rieu: I play whatever comes to mind. You are seen In many photos with a violin ... Rieu: That is logical, that is my image. I am also known as a violinist. And you own a very valuable instrument. Rieu: I own three violins including a Stradivarius from 1732. To own this violin is for me personally great pleasure and fun. How many hours you play per day? Rieu: When I give interviews, less. And when I 'm on vacation, I am happy to retire with my violin and practice. You have to practice. Use it or lose it. A couple of hours a day is fine. What do you do to fight routine? Rieu: That does not happen to me. It's always fun, I'm always nervous, because my audience for me is always an unknown part. I know my job, but I do not know how the audience will react. And when evening was bad, the audience is not coming back. But it must, however, otherwise no one will pay me, I have to earn everything myself. Anyway, I'm the only one in the world who does that. All other orchestras are subsidized. I think that's ok, but I rather do it myself. And you are still really excited? Rieu: Yes. Otherwise it would not work. You cannot go on stage being bored100 to 120 times per year. The people would notice that immediately. What is typical Dutch on you? Rieu: I believe nothing. I do not feel like a Dutchman, but more like a citizen of the world. The only thing that maybe Dutch in me is that I am "down to earth". We are quite happy being Dutch and we say: "Just be normal, and you'll be quite crazy already." Are you actually a good waltz dancer? Rieu: No, I’d rather play waltzes. On stage, I do not dance because there I can stand back and watch the others, which is much nicer. In your autobiography it states that you almost opened up a pizza restaurant. Rieu: We actually wanted to open up a pizzeria, but that still remains just an idea. Back then we had already made a menu card and the most expensive pizza was "Pizza Paganini". The plan was then for me to play the violin while this pizza was being served. And for that reason, I again began to practice - and then I thought: "No, I will just omit the Pizzeria." When you are on tour, do you have two cooks with you? Rieu: Yes, many times even three. This is important for health. Is pizza also being served? Rieu: No. Pizza is unhealthy. Pizza is just flour. Pizza was actually a poor person’s meal, formerly in Italy. But when you ask children ... Rieu: You should not ask children what is healthy! Otherwise, they only eat what is tasty and pizza. One cannot live by pizza alone. My secret recipe for a healthy diet: Twice a week white meat, two times a week white fish, once a week red meat, once a week oily/fatty fish - and once a week you may go to McDonald's if you so desire. If you follow that, you will live a healthy life. Thank You to Ineke and Elke for this and John for ©Translating it. I know for a fact his cooks serve up many a meal that would be considered "unhealthy" (the banofee pie comes to mind, or all those times they served poffertjs or cheese fondue) so why not pizza, one wonders. But nice interview, I guess, thanks for throwing it on. Henk. Now I know what to eat, on my new 2014 'stay healthy' diet regime! Thanks Andre! André is always full of passion for his job and that make me very happy. For the diet, it's a good recipe, just eat a few of anything and enjoy sometime a big cake or a McDonald. Thanks Ineke and John I don't want to forget Sue.